At Valley Child Care & Learning Centers, we have 10 convenient locations throughout Phoenix, and we can provide you with the high-quality early childhood education you deserve. Give us a call to learn more! If you’re looking for high-quality daycare and preschool programs with teachers you can trust, then you need Valley Child Care & Learning Centers. Give us a call to learn more and enroll your child today! Each of our talented teachers is DES-certified providers of preschool, child care, and daycare. As part of our commitment to being the best early learning centers around, we are proud participants in the Quality First program of Arizona’s First Things First initiative. Give us a call for more information or stop by – we know you’ll like what you see! As a parent, you know that choosing a preschool, day care, or infant care center is a crucial decision, and so do we! We recognize that a child's first few years lay the foundation for the rest of his or her development, so we strive to make our preschool education program and early childhood learning center the most nurturing place possible. We are proud to have offered quality, affordable early childhood programs for infants, toddlers and preschoolers for 50 years! Our 10 early childhood learning centers each offer a variety of developmentally appropriate educational programs to help prepare your child for the exciting challenges of kindergarten, first grade, and beyond. Our team at Valley Child Care & Learning Centers believes that even the best child care services can’t be effective for children who are hungry. As part of our complete child nutrition program, your child will enjoy a nutritionally balanced breakfast, snack, and lunch. To find rates for our child care facility near you, click on the “Locations” tab at the top of this page and choose the location nearest you. Once on that location’s page, scroll to the bottom to see the rates for that location. Our company has evolved into not only a high-quality child care provider, but also an early childhood learning center that will enhance the educational development of your child. We have established more than 48 centers countrywide to date. If you are a parent looking for the best early childhood education programs in the Phoenix area, you can trust Valley Child Care & Learning Centers for your daycare and early learning needs. The quality of our infant, toddler, and preschool programs is unmatched by any other child care facility in the area. Our priority is always to provide your children with a safe and welcoming environment that is staffed with qualified and caring teachers. Since we opened the first of our 10 early childhood learning centers in 1967, our company has always been the leader in the metro Phoenix area for infant, toddler, preschool, and early education programs. 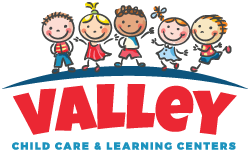 Valley Learning Centers is here to provide parents with the finest child care and early education services in Phoenix, so give us a call to learn more and enroll today! At Valley Child Care & Learning Centers, you will find that our commitment to high-quality care and education shows in everything we do. Your child will receive the personal support and attention that is necessary to build trust and confidence. We know that selecting preschool, day care, or infant care can be a challenge for concerned parents, and rightly so. The first years of life are critical to your child's long-term development, making your choice of an early childhood learning center one of the most vital decisions you will ever make as a parent.